Just as you use a Customer list in QuickBooks to keep records on all your customers, you use a Vendor list to keep records on your vendors. Like a Customer list, a Vendor list lets you collect and record information, such as the vendor’s address, the contact person, and so on. 1Choose the Vendors→Vendor Center command. 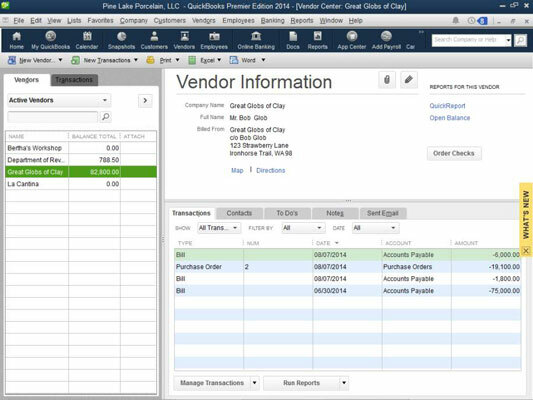 When you do, QuickBooks displays the Vendor Center window. 2To add a new vendor, click the New Vendor button and then select New Vendor from the drop-down list. 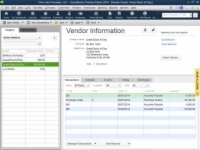 QuickBooks displays the New Vendor window. 3Give the vendor a name in the Vendor Name box. 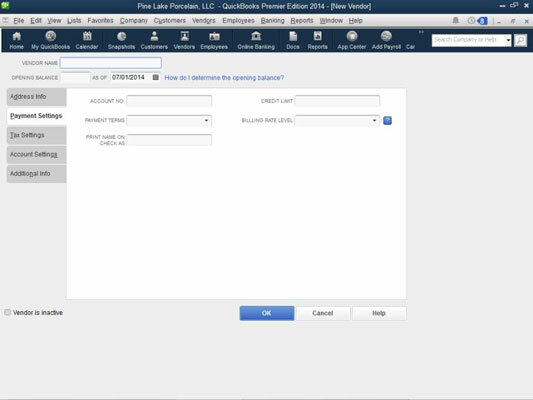 As is the case with the Customer:Job list, you use this name to refer to the vendor within QuickBooks. For this reason, an abbreviation is fine. You just want something easy to enter and easy to remember. 4(Optional) If you pay your vendor in a currency different from your usual home currency, select that currency from the Currency drop-down list. 5(Usual rule) Ignore the Opening Balance and As Of fields. Don’t do anything with the Opening Balance and As Of boxes. People who don’t know better use those boxes to enter the opening balance owed a vendor and the date the amount is owed. But this only creates problems later. At some point in the future, this poor soul’s accountant will need to find and correct this error. As when you add new customers, however, an exception to the usual rule exists. Although the usual rule is that you don’t want to set an opening balance for a vendor, this rule has an important exception. You record your accounts payable balance on the conversion date by setting an opening balance for each vendor as of the conversion date. The sum of these opening balances is what QuickBooks uses to determine your total accounts payable on the conversion date. 6Supply the vendor address information. The Address Info tab supplies a bunch of easy-to-understand boxes that you use to collect vendor name and address information. You enter, predictably, the vendor’s full name in the Company Name box. 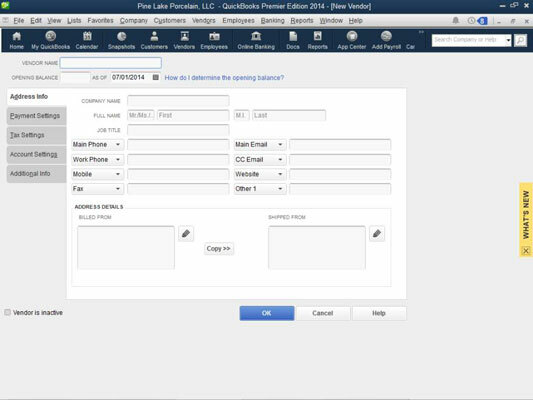 You can click the Edit buttons on the Address Info tab to display another dialog box called the Edit Address Information dialog box, which lets you enter the address in typical street address, city, state, and zip-code format. The Edit buttons appear to the right of the Billed From and Shipped From address blocks. 7Supply any additional information necessary. The Tax Settings tab lets you collect the vendor’s tax identification number so you can (as sometimes required by federal tax laws) send the vendor a Form 1099 at the end of the year. 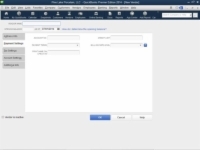 The Account Settings tab lets you specify which accounts QuickBooks should use to prefill account fields when entering a transaction for the vendor. The Additional Info tab lets you categorize the vendor according to type and also lets you create other custom fields. If you’re paying a vendor for the first time, a good guideline is to get his tax ID number. If somebody won’t give you his tax ID number — thereby making it impossible for you to report payments that you make to him — it’s probably a sign of something a bit amiss. 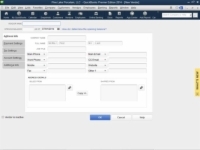 If you click the Account Settings tab (the fourth tab available on the New Vendor window), QuickBooks displays boxes you can use to list the accounts that you want QuickBooks to automatically fill in for you when you record a check to some vendor or when you record a bill from some vendor. For example, if the check to the landlord always pays rent expense and utilities expense, you could tell QuickBooks to prefill, using these two accounts every time you indicate that you’re writing a check to or recording a bill from the landlord.